I found a beautiful desk that I am refinishing for my daughter’s bedroom. I am very excited about it because it is really a good quality and in good condition. It definitely needs a new finish and I am still deciding on what color I want to go with. My daughter is 11 and I want something that will transition into her teen years and hopefully beyond. I have also promised a redo for her bedroom and she wants the walls painted green which somewhat narrows the color choices. I was originally liking green for the desk but that would be way too much green for her room. My sweet little girl has outgrown pink and so any mention of pink is violently opposed! Of course white would be nice but then we still need to choose the shade of white – yes there are shades of white! I am leaning towards the color periwinkle with silver accents but again I have to find the right shade. In the meantime I am excited to get started so I removed the tarnished drawer pulls to clean them up. I played around with a couple cleaners and even tried soaking in Coca Cola but I wanted more immediate gratification! 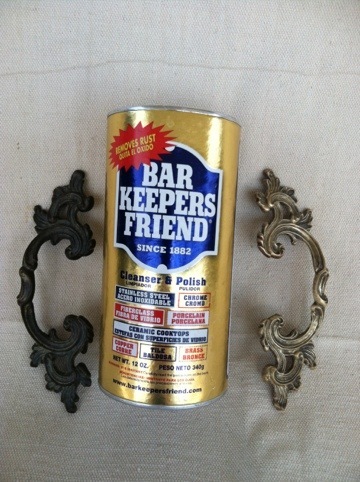 Bar Keepers Friend worked great with a little bit of scrubbing with a tooth brush I still had some nice patina but a little brightness too. Because I was thinking about silver accents I thought about spray painting them silver but now I am in love with the way they look. 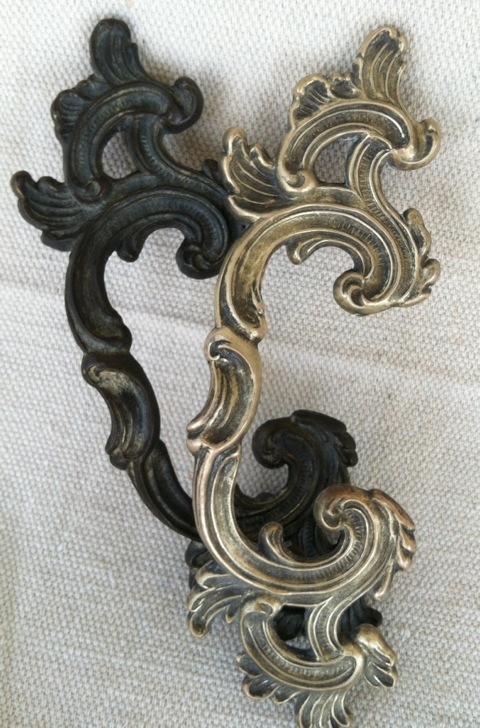 I may have to re-think the silver accents… Oh well I guess I can finish up the drawer pulls while I think about it. I wonder if Taco Bell sauce would work !! I love the way they look right now—beautiful, Jess.